I'm donating this book to The Little Free Library project in Nashua, NH once I finish reading it. I purchased it from the Night Worms horror fiction subscription box. You can check them out HERE! This little book looks innocuous enough, doesn’t it? Soothing waves of blue and green grace the cover. Perhaps it was about an adorable sea monster or even a meaner one crunching and munching its way through a bunch of B-movie characters who kind of, sort of deserved everything they were getting. It isn’t either of those things. 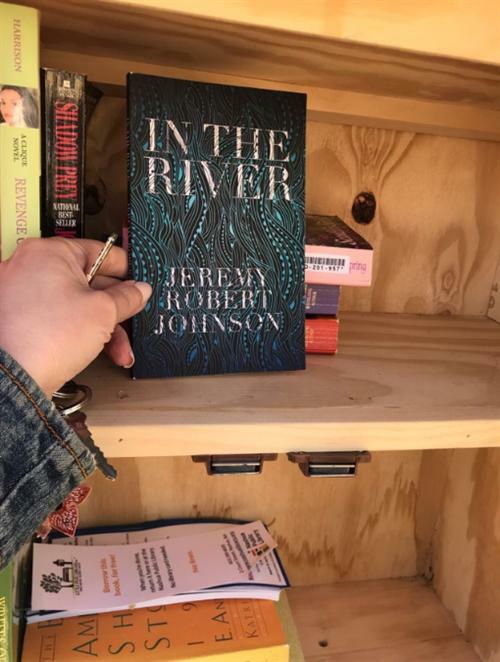 In The River is a deadly serious examination of pain and madness and it is one of those books that will not leave you after you turn the last page. It seeps under your skin and even now, quite a few days later, the images and emotions still bubble to the surface of my brain and continue to haunt me. I assumed I was going to give it a read in-between the bigger books and move along feeling accomplished that I finished a book in a few hours. That didn’t happen. I finished it quickly enough because I had to know what happened but I found myself unable to start up anything else for several days and watched tv and listened to podcasts in order to clear my head instead. So be warned, this one may be slight but it will wound you deeply and if it doesn’t I fear for you a little. I can’t tell you much about the plot and honestly I am struggling with this review. I have put it off for days and days because I didn’t want to think about it. I’ll only say that it’s about a man and his boy and a fishing expedition that doesn’t end at all the way it should’ve ended. It hits you with a grueling image and prose that says only just enough to destroy you and just when you begin to believe that you’re ready to continue on and see where it leads and that you’ve perhaps recovered emotionally, it smacks you again with another terrible image for good measure. This is true horror, people, the kind that leaves scars on your soul. In The River wasn’t an easy read but it was incredibly moving and incredibly painful and it made me feel all the anguish. This book gets all five stars. If you’re up for a good gutting, give it a read. I don’t think you’ll be sorry.